I am trying to understand the process of how an apk is installed on Android, specifically the Android SDK emulator via adb install (where i am testing). In searching I have found no satisfactory answer outside of "the apk is simply copied to /data/app and is installed when you run it. This is not satisfactory to me as it does not explain how the apk's icon appears on the menu amongst other issues. Coming from a Windows background, running an .exe or installer to install a program modifies registries, files, services, etc.... I need to understand if this or something similar occurrs when an apk is installed on Android. So if anyone can explain to me what occurrs specifically when an apk is installed on Android I would greatly appreciate it. On a side note I would also like to know if the Dalvik VM "zygote" is involved in the installation or does it occur at the lower linux kernel level? My ultimate goal here is to use strace to caputer the installation process of an apk to document system modifications, file creations, network activity and other events of interest. There are mainly two categories of Android applications. User Apps: installed from Play store, using ADB or copying .apk file in SD card. Following are the step by step installation process. .dex file, which is extracted from the .apk file, is copied to /data/dalvik-cache/. Everything that you want to know, I think, is in the Android develeper website http://developer.android.com/tools/building/index.html and to understand packaging of the app itself, here is the image better (it's not the APK installation process, but it can help you understand the apk structure and instalation). You can also google about aapt tool and .dex to understand more because classes.dex is the substruction of your application - contains the java and classes compiled. 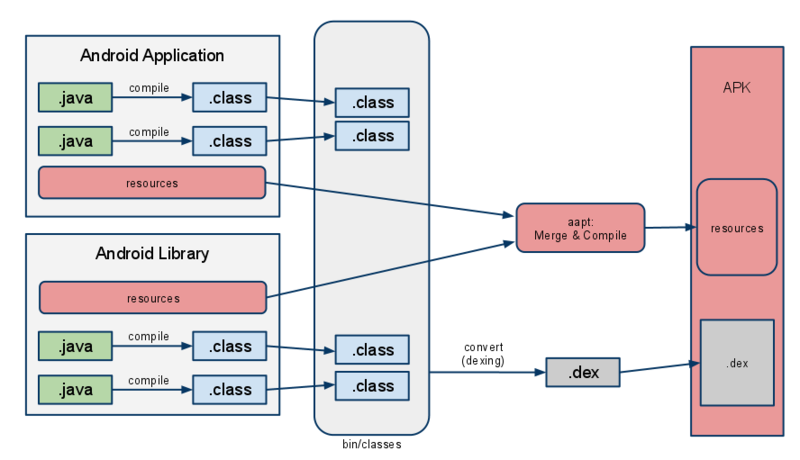 One dex file contains multiple classes as opposed to java class file which contain only that one class. dex file is java bytecode converted with DX tool which is integral part of Android SDK. As a result of that, it allows every application to run as its own process with its own instance of the Dalvik virtual machine. This is done at two levels 1.) PackageInstaller(UI) using PackageManagerService(System service) sending command to 2nd part(Installd) 2.) Installd is a daemon which actually install the apk. Installd and PackageManagerService communicate using socket communication . Socket used is installd itself. You can refer to init.rc for the socket creation at init. Not the answer you're looking for? Browse other questions tagged android installation apk or ask your own question. “How are” Android applications (Facebook etc.) installed to an android phone? Where is Android App Code stored?